Cast Iron Radiators Ltd What is the maximum size for a cast iron radiator? What is the maximum size for a cast iron radiator? There is no maximum length of cast iron radiators that we supply - for very large rooms we have assembled cast iron radiators of over 4 metres! Cast iron radiators that are longer than 1.2m either be delivered partially assembled or we can send a specialist courier and an engineer to site to finish off the assembly. Cast Iron Radiators up to 2.4m can be sent on a double pallet for an extra cost. 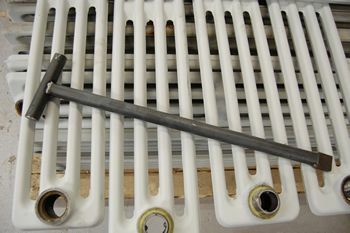 It is not possible to send cast iron radiators above 1.2m because they will not fit on a pallet. We can send a Cast Iron Radiators up to 2.4m on a double pallet for an extra cost. If you order a oversize cast iron radiators, we will supply an assembly tool with a fully refundable deposit and full instructions as to how to assemble your radiator. You will also receive British or European made gaskets (subject to which model you choose) and the joining threads to put the radiator together. If you would prefer us to come and assemble the cast iron radiator onsite, we have an engineer on the road who can come and do this for you. The price of this is dependent upon your location. Please call us on 01723 321 000 to discuss your requirements.